Little Trinity 3 Grain Blend is part of the Northern Border Collection, a series of four whiskies released in limited numbers each year starting this year. Each vintage will be different. 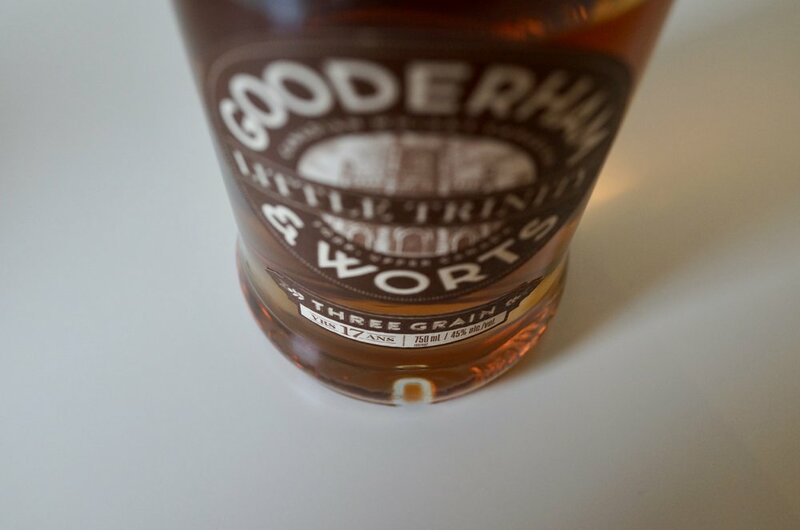 This year’s Gooderham & Worts is focused on three grains: corn, rye, and wheat. It’s primarily aged in ex-bourbon casks, and carries a seventeen year old age statement. This is unlike the general release product, Gooderham & Worts Four Grain, which has the addition of malted barley. The Four Grain version, available year around, is one of my favorite daily drinking whiskies from Canada. I’ve recommended it repeatedly to whisky drinkers, and so I’m invested to see how Little Trinity Three Grain holds up. If I were to narrow this whisky down to theme, it’s all about a rye and oak inspired spicy finish. You’ll be hard-pressed to find a whisky with a longer finish, and certainly in this price-range (around $80). The popular “peppery spice” note in whisky comes from two possible parts of the whisky making process. It can come from rye if used during fermentation, or it can come from barrel maturation. Little Trinity amps both up in complement. The finish on this is crazy. It starts through the middle, and continues for minutes afterwards. The combination of rye peppery spice and 17 year old barrel maturation is intense. Along with all that spice, familiar caramel notes are intensely present at the start. The Northern Border Collection is highly sought after, and Little Trinity is a great addition. Nose: Rich oils, charred oak, fruit compote on the stove (primarily blackberries), black tea leaves, melting caramel. In time, beautiful blood orange zest comes through. The nose has a maturity to it. Palate: It’s a beautiful three stage whisky. First, warm caramel envelopes the palate beautifully, giving it a nice ‘hug’ hello. This is followed by freshly ground peppercorn spice, dried fruit sweetness, touch of char smoke, and a beautifully buttery oily coating that lasts and lasts. In its third act, your palate is filled with this same beautiful buttery coating along with blackberry jam sweetness, and with an endless supply of peppercorn spice (the finish is truly minutes long). The spice is beautiful. These flavours work beautifully—the caramels are tempered, and the rich buttery notes from start to finish are beautiful. This is a whisky from Canada, to be sure (rich caramels, peppercorn spice, etc.) but there’s a calm beauty to Little Trinity that makes it not like the others. It’s rich, delicious, and unique.